I needed a couple of quick puffs instead of my usual slow-acting cannabis infused coffee so I could really focus on some of the new stories that are about as clear as mud to readers and viewers. Let's take a shot at trying to clear the waters. Here's what's happening: Trump has shut our government down and 800,000 federal workers have been furloughed with no pay. When GoFundMe pages popped up to help the workers families...the government stepped in and said, "Hell, No!" Yesterday our pathetic excuse for a president spoke to members of the Pentagon. He was supposed (key words) to be there to discuss a new missal defense system we've installed in some areas (like Alaska), and our further commitment to stopping foreign powers from hitting America with nukes. He did spend a few minutes on the subject but then turned it into a partisan rant about the need for a southern border wall and how bad the Democrats are because they could care less about the America peoples safety. My confusion comes from the fact that lately, every time Trump trots out and appears somewhere (Farmer Convention in New Orleans last week) he goes off subject and uses the event to stump for his vanity wall. He dreams about an image of himself standing before a giant wall while his supporters cheer him on endlessly. My question is when is this tactic going to get old? It sure didn't work during the midterms. Trump has become a one-note tyrant. As for the Mueller investigation: Trump's allies constantly shifting stories about the 2016 election campaign has left the majority of the country confused, angry, and suspicious. Most recent example: Rudy Giuliani contradicts 18 months of "No Collusion" claims. So what are American's supposed to think? With Trump declaring the mainstream press "an enemy of the people" he has infused even more confusion among people trying to really understand what's happening in our country. 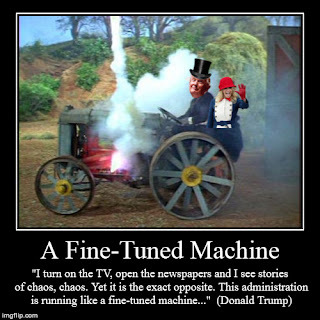 When you see Mike Pence declaring ISIS has been defeated and it's time to go home (despite hearing about the death of American servicemen in an attack in Syria that same day), it's apparent there's a real disconnect between reality and the illusions Trump and his minions are spinning.